The fashion scene in Tokyo is extremely vibrant based on so many amazing districts. Internationally, the buzzing districts of Harajuku, Ginza and Shibuya stand out with Shinjuku and Ikebukuro also belonging to the major fashion areas of Tokyo. Aoyama is also internationally famous within the fashion world even if this district isn’t so famous in terms of Harajuku, Ginza, and Shibuya when applied to lay people and international tourists. However, countless districts like Aoyama and Daikanyama attract fashion lovers in Tokyo based on personal preferences and clearly both districts have an abundance of amazing Japanese and international boutiques. The Daikanyama fashion district especially appeals to the younger generation while Aoyama is notably strong for people in their mid-twenties to late-forties. Of course, people of all age groups visit and shop in Aoyama and Daikanyama because generalization is always dangerous. Also, Daikanyama is especially attractive for families and individuals who commute to major commercial districts in Tokyo. Likewise, individuals with major capital – irrespective of age – can shop at adorable boutiques in both amazing fashion districts in Tokyo. 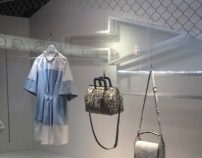 In Daikanyama notable stores include Actus, Loveless, Evisu, Hollywood Ranch, Bonjou Recors, Tsumori Chisato, Silas and Maria, Arigato, Hemisphere, APC, Via Bus Stop, United Bamboo, Denime, and many others like Alfredo Bannister. The above-named stores are only a tip of the iceberg because you have so many fantastic boutiques to visit in Daikanyama. On top of this, the layout in Daikanyama is extremely attractive and you have ample places to eat out and relax. Another major bonus is the closeness of Ebisu because this fashion district based on the close proximity to Daikanyama creates a sizeable fashion zone. Aoyama is one of the major powerhouses in Tokyo when it comes to the crème de la crème of Japanese and international brands. Similarly, the architectural angle is extremely impressive because you have so many amazing buildings. Therefore, for individuals who adore luxury lifestyles then Aoyama is a rare treat. In saying that, you also have a lovely luxury angle to Daikanyama in vibrant Tokyo. Luxury lifestyles in Tokyo can certainly be felt in both Aoyama and Daikanyama. Also, the European angle in Daikanyama is a rare bonus and this adds to the amazing complexity of Tokyo.